The Sun has been in the news a lot lately because it’s beginning to send out more flares and solar storms. Its recent turmoil is particularly newsworthy because the Sun was very quiet for an unusually long time. Astronomers had a tough time explaining the extended solar minimum. New computer simulations imply that the Sun’s long quiet spell resulted from changing flows of hot plasma within it. The Sun is made of a fourth state of matter – plasma, in which negative electrons and positive ions flow freely. Flowing plasma creates magnetic fields, which lie at the core of solar activity like flares, eruptions, and sunspots. Astronomers have known for decades that the Sun’s activity rises and falls in a cycle that lasts 11 years on average. 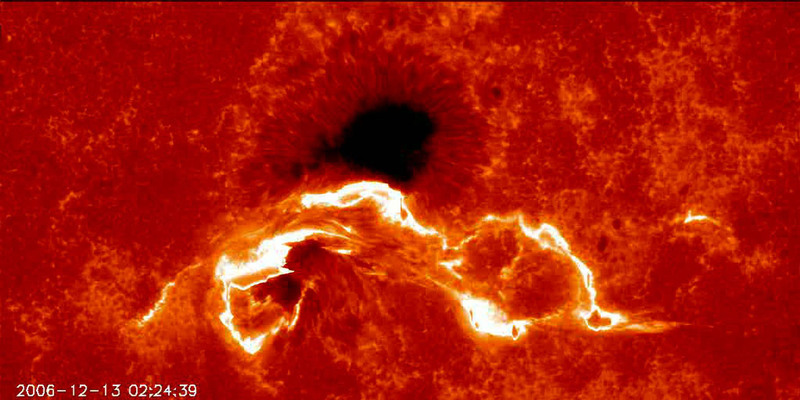 At its most active, called solar maximum, dark sunspots dot the Sun’s surface and frequent eruptions send billions of tons of hot plasma into space. If the plasma hits Earth, it can disrupt communications and electrical grids and short out satellites. During solar minimum, the Sun calms down and both sunspots and eruptions are rare. The effects on Earth, while less dramatic, are still significant. For example, Earth’s outer atmosphere shrinks closer to the surface, meaning there is less drag on orbiting space junk. Also, the solar wind that blows through the solar system (and its associated magnetic field) weakens, allowing more cosmic rays to reach us from interstellar space. To study the problem, Muñoz-Jaramillo used computer simulations to model the Sun’s behavior over 210 activity cycles spanning some 2,000 years. He specifically looked at the role of the plasma rivers that circulate from the Sun’s equator to higher latitudes. These currents flow much like Earth’s ocean currents: rising at the equator, streaming toward the poles, then sinking and flowing back to the equator. At a typical speed of 40 miles per hour, it takes about 11 years to make one loop. Sunspots, such as this one, disappeared from 2008 to 2010, leaving the sun quiet for an unusually long time. (Photo courtesy of Hinode Mission). Muñoz-Jaramillo and his colleagues discovered that the Sun’s plasma rivers speed up and slow down like a malfunctioning conveyor belt. They find that a faster flow during the first half of the solar cycle, followed by a slower flow in the second half of the cycle, can lead to an extended solar minimum. The cause of the speed-up and slowdown likely involves a complicated feedback between the plasma flow and solar magnetic fields. “It’s like a production line – a slowdown puts ‘distance’ between the end of the last solar cycle and the start of the new one,” says Muñoz-Jaramillo. The ultimate goal of studies like this is to predict upcoming solar maxima and minima – both their strength and timing. 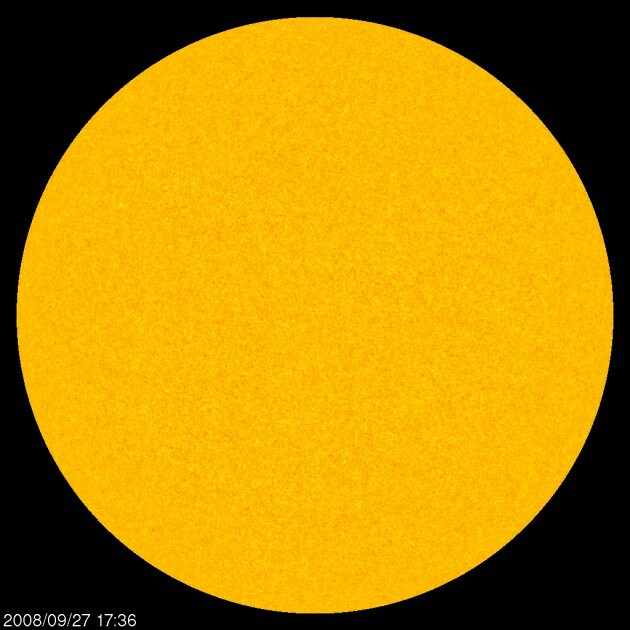 The team focused on simulating solar minima, and say that they can’t forecast the next solar minimum (which is expected to occur in 2019) just yet. Their findings appear in the March 3 issue of the journal Nature. The paper is co-authored by Nandy, Muñoz-Jaramillo, and Petrus Martens (Montana State University and CfA).